BEIRUT: Lebanon's Parliament elected the commander of the Lebanese Armed Forces General Michel Suleiman as president on Sunday, ending six months of presidential vacuum. Suleiman got 118 out of the 127 votes cast, with six blank ballots and three invalid ones. The votes counted as invalid were cast for Nassib Lahoud, Jean Obeid and "slain former Premier Rafik Hariri and the martyred MPs." The election took place in the presence of Qatari Emir Sheikh Hamad bin Khalifa al-Thani, his Prime Minister Sheikh Hamad bin Jassem al-Thani, members of the Arab ministerial committee which brokered the recent Doha agreement, Arab League chief Amr Moussa, and a number of senior Arab and international figures (see the complete list of attendees on page 8). 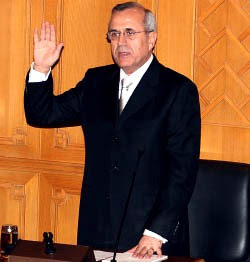 After Suleiman was sworn in, the government of Prime Minister Fouad Siniora resigned in line with the Constitution but will stay on in a caretaker capacity. Suleiman arrived at Parliament shortly after the election accompanied by Speaker Nabih Berri, who left the Parliament building after the vote and returned with the newly elected president in line with protocol. After taking the presidential oath, Suleiman delivered an inaugural address that dealth with several contentious issues, including Lebanese-Syrian ties and the deadly clashes that struck Lebanon earlier this month. He called for good and balanced relations with Damascus - whose foreign minister, Walid Moallem, was in attendance - based on mutual respect. "Both Lebanon and Syria should also respect each other's borders," the president added. In an indirect reference to the recent clashes between opposition and pro-government supporters, Suleiman said Lebanon's weapons should only be directed at the Israeli enemy. Prior to Suleiman's address, Berri congratulated the new president and praised the patience and sacrifices of the Lebanese people. "This is a historic moment," Berri said. "I ask God to help you succeed in steering the Lebanese ship to a safe haven ... today no one in the world can turn Lebanon into a fighting arena," he added, addressing Suleiman. Berri thanked various countries, including Russia, France, Italy, Spain as well as the Arab League for their help in bringing an end to the 18-month old political crisis. But he took a swipe at Washington, saying: "I thank the United States nonetheless, seeing that it seems to have been convinced that Lebanon is not the appropriate place for its New Middle East plan." He was referring to comments made by US Secretary of State Condoleezza Rice, who described the plight of Lebanon during Israel's 2006 war against it as part of the "birth pangs of the New Middle East." BEIRUT: "The dangerous political crisis that threatened to lead to the collapse of Lebanon has ended, and we hope this crisis is the last," Qatari Emir Sheikh Hamad bin Khalifah al-Thani said in an address to the Lebanese Parliament and newly elected President Michel Suleiman on Sunday. With myriad local and foreign dignitaries crowding Lebanon's reconstructed Parliament building for back-to-back election and inauguration ceremonies, the Qatari emir stressed that the dangers facing the Arab world "do not permit the renewal of conflict between parties every now and again." "The fate of nations, more important than factional disputes, is at stake in our region," added Sheikh Hamad, who helped pressure feuding Lebanese factions into the recent Doha talks that ultimately resulted in an accord after the country seemed on the brink of another civil war. A recurrent theme during the emir's address to the House was his allusion to the "no victor, no vanquished" staple of Lebanese politics, as he at once hoped that the Doha talks transcended that approach, "which buries rather than solves crises," and stated that the Doha agreement saw to it that "Lebanon vanquished strife" by resorting to dialogue. "All the [Doha process] did was to provide a locale for dialogue in the absence of pressure, and I believe the chance afforded by such a dialogue reached its natural conclusion," the Qatari ruler added. WASHINGTON: US President George W. Bush led the international community on Sunday in hailing the election of Michel Suleiman as Lebanon's new president as a first step in reuniting the divided nation. "I am confident that Lebanon has chosen a leader committed to protecting its sovereignty, extending the government's authority over all of Lebanon, and upholding Lebanon's international obligations under UN Security Council Resolutions," Bush said. "We look forward to working with president Suleiman in pursuit of our common values of freedom and independence." Suleiman, Lebanon's army chief for the past 10 years, was sworn in on Sunday after a parliamentary vote that many hope will turn the page on an 18-month political feud that threatened to plunge the nation back into civil war. The vote was held just days after the government and the opposition agreed to a deal after talks in Doha to end the political crisis. Bush said he was "hopeful that the Doha agreement, which paved the way for this election, will usher in an era of political reconciliation to the benefit of all Lebanese."